This the third in a series of tutorials intended to develop basic star-hopping skills. The focus of these tutorials is not on finding particular deep sky objects, but rather on using hops to selected objects as a vehicle for illustrating star-hopping techniques. A bright nova in our local galaxy was discovered on July 7th by Koichi Nishiyama and Fujio Kabashima and has been assigned the preliminary name of PNV J18202726-2744263 or Nova Sagittarii 2012 No. 4. It is currently at magnitude 7.7, putting it well within reach of urban astronomers using only binoculars or small telescopes. It is located between Sagittarius' teapot's spout and top, so it will be somewhat low on the horizon for mid-latitude northern observers. Add hazy summer nights, light pollution, and an area crowded with lots of Milky Way stars, and you may not find it so easy to locate this nova. 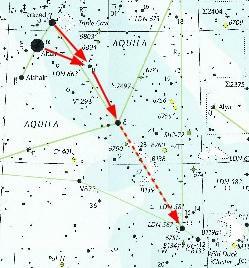 To assist you, I've generated a complete set of AAVSO finder charts.